We’ve rounded up six fun games for you and your faithful friend to try. None of them require more equipment than a toy to throw or treats to hide—you probably have everything you need on hand right now. So head outside, get to playing and watch as the tension and boredom melt away from your pooch (and probably you, too)! A dog’s sense of smell is somewhere between 10,000 and 100,000 times better than humans (if this same ratio was applied to sight, where a human could see a quarter mile ahead, a dog could see up to 25,000 miles ahead). Incorporating scent tracking into play is an excellent way to invigorate your dog with multi-sensory activities. Hide treats: Place treats throughout your yard or house and let your dog search for them. Tracking: Take the classic “catch” a step further—instead of throwing the toy where your dog can see it, place a toy or treat out of sight and make them sniff it out. If your dog is easily finding the treats, make this more complex by hiding them in harder-to-find places. Another option is to leave your dog in a separate area, such as inside the house, while you’re hiding the treat outside. Find the treat: Place a few containers upside down, with a favorite toy or treat under a specific one. Let your dog smell each container, and wait for him or her to pause at the one holding the prize. You know it. You love it. This classic game is a great way to exercise your dog mentally and physically. To keep things fresh, instead of continually throwing a ball or toy in the same manner, vary the direction, height and distance of your throws. The flying disc has been loved by athletic dogs and their owners for decades. This game promotes skill and speed, since the goal is to catch the disc in mid-air. Can’t get Fido to catch the disc? Some dogs hate the feeling of hard plastic in their mouths. Try a softer flying disc instead. If your dog’s still not interested, try playing Frisbee with another person —in no time your dog will realize how much fun he or she could be having! A rainy or snowy day doesn’t mean that you and your furry friend are doomed to boredom. Setting up a game like “under, over and through” wears out your dog and provides a bonding experience for both of you. For this game, set up an obstacle course in your house for your dog to run under, jump over or go through. Use household objects like chairs, stools, tables, or other sturdy objects to set up the course. Then coax your dog through (and under, and over) using treats and praise. A great way to play with your dog is to start a chase. In this game, you act as a canine play partner. To start the game, bend forward and hop backwards before running off in another direction. Let your dog chase you before finally catching up, then give them lots of praise and affection to encourage them. As you introduce new games to your dog, give him or her enthusiastic congratulations when he or she figures them out—and gentle correction as your dog learns the rules. 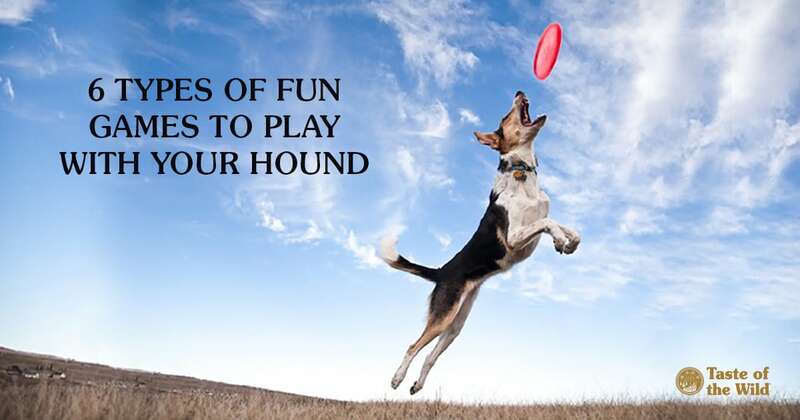 By keeping a positive attitude, you can make these games a healthy, happy part of your dog’s lifestyle for years to come. If your dog isn’t used to playing every day, talk to your veterinarian about the best way to start increasing his or her daily activity level. You may need to start slow, but consistent and rigorous exercise is the best way to keep your furry pal healthy and happy for the long haul.